Breathtaking Floral Designs for Your Wedding. It’s the opportunity to create the wedding of your dreams. 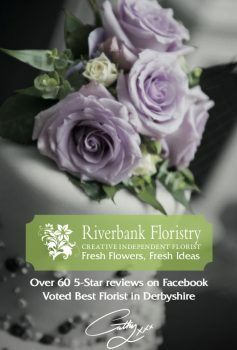 I love talking flowers and I love creating flowers for weddings. This is your special day, so I work with you every step of the way to ensure that you realise your dreams in this very personal part of your wedding plans. Together we can create a wedding day that is truly memorable for you and your guests. Whether you have a clear idea of what you require, or would like some advice and inspiration, call me. Tell me the style you like and I’ll suggest flowers that create the wedding around you. Whether you’re planning a small intimate gathering or a large elaborate occasion, bring along your mood boards, colour schemes or just a scrap book and we can design arrangements that compliment your style and enhance any venue. For a free, no-obligation consultation come and see me and we can relax over a coffee and I’ll show you how to get the most impact from your budget. I don’t have an expensive shop front, my overheads are low so I can pass those savings on to you so you can spend them on your honeymoon! You’ll be invited to view all flowers the day before your wedding to make sure everything is to your complete satisfaction. 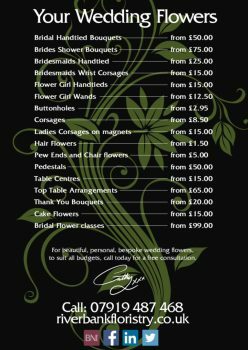 So I can give you the best possible service, I never accept any other events for your wedding day. You get my undivided attention, as I do everything necessary to keep your wedding flowers looking gorgeous throughout the day. Call me now and we can plan your perfect day. Many testimonials are available on request from previous brides.